This newsletter is published weekly on the website as well as on our Facebook page. Search for ‘Orthodox Church of The Nativity of the Mother of God, Bristol’ (please view and ‘like’ us). DID YOU KNOW that the parish also has a YouTube channel? Search on YouTube for ‘Orthodox Church of The Nativity of the Mother of God, Bristol’. You will find sermons and service clips from our church. Last Sunday many of our children and their parents made a procession with icons to commemorate the Sunday of Orthodoxy – the Restoration of the honouring of icons. On Sunday Archimandrite Kyril strongly urged all our parishioners to come to at least some of the weekday services in the Great Fast. Only on weekdays can you experience the special character and quality of the Fasting or ‘Lenten’ services. The weekends are. as always, festal days. If you miss the weekday services you have not experienced the liturgical tradition of The Fast! Look at the Calendar below and see what you can come to. FEAST OF THE ANNUNCIATION Monday 25th March. Reminder: Monday will be both a fast day and a feast day, as the feast falls in the Fast. What this means is that the Divine Liturgy of the Feast is celebrated after Vespers in the evening of the feast day. So, if you are going to communion on the feast (Monday), you fast in principle from midnight till communion. But because it is a Great Feast fish, wine and oil are allowed when we do eat. HAS THE FOODBANK SLIPPED YOUR MIND? The need for contributions to the Foodbank is as great as ever. Please continue giving. 10.30 a.m. Divine Liturgy Tone 2. Second Sunday of the Great Fast. 10.30 a.m. Divine Liturgy and Veneration of the Cross Tone 3. Third Sunday of the Great Fast. Veneration of the Cross. Mid-Lent. 10.30 a.m. Divine Liturgy Tone 4. Fourth Sunday of the Great Fast. Commemoration of St John of the Ladder. KOLLYVA (kolyva, koliva,kollyba,colivă, koljivo, zhito… ) It is a widespread custom among the Orthodox to prepare a dish called kollyva to commemorate the dead and to celebrate special occasions (such as the day of St Theodore on the first Saturday of the Great Fast, just past). You will have seen such a dish by the table for the dead when we celebrate a memorial service. The kollyva is then shared between those present to remember those commemorated. In order to encourage those who are unfamiliar with the custom, or are not sure how to prepare kollyva, we give a sample recipe below. There are, of course, very many variations and you may choose to research your own. The web has dozens. The basis of the dish is wheat berries (whole wheat grain). You can buy this from wholefood shops. Soak the wheat at least 6 hours, or overnight, in cold water. Throw away the water and put the wheat in a pan and cover well with fresh water. Boil till the wheat is cooked – check: it depends on the grain, etc. (or pressure cook for 15 minutes). Strain and leave to cool. Mix together the wheat, fruit, spices and pomegranate seeds. This can be done a day ahead and the mixture covered and kept in a refrigerator. On the day, warm the honey so it is runny, tip into a bowl and add the vanilla essence and brandy (if using). Add to the dry mixture and stir in. Choose a suitable dish and arrange the kollyva in it. It can then be decorated. You can use icing sugar, but only put it on at church shortly before use, as this recipe gives a damp mixture. Some other recipes are drier. We just use the almonds to make a cross, but as you will find from a web search you can really ‘go to town’! A candle can be stood in the middle of the dish to be lit during the memorial service. You are receiving this newsletter by email because you have given us your email address. You can decide to withdraw your consent at any time by emailing info@bristol-orthodox-church.co.uk and putting ‘Unsubscribe’ in the subject box. We will then delete your email address from our mailing list and email you to say that we have done so. 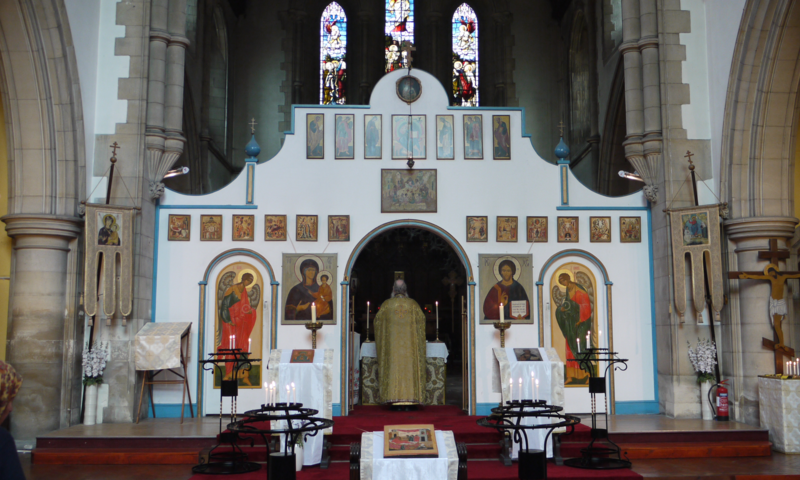 The Eastern Orthodox Church of the Nativity of the Mother of God, University Rd, Bristol BS8 1SP, registered Charity No. 290747, is a member Parish of the Archdiocese of Thyateira and Great Britain, Ecumenical Patriarchate of Constantinople.